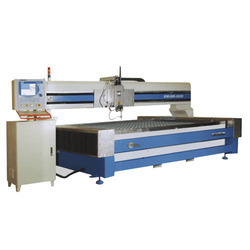 We are the leading manufacturer and supplier of Water jet Cutting Machinemade from high quality material. While at first you may not anticipate that water will be such a capable cutting apparatus; Water jet Cutting Machine can slice through as much as an eight-inch stainless steel plate and 10 creeps of aluminum plate. Waterjet cutting is the favored technique for materials that are touchy to the high temperatures frequently produced when utilizing different strategies. Since there is no warmth influenced zone (HAZ), this limits the impacts of warmth, enabling metal to be cut without modifying or harming the surface of the materials being cut. Waterjets are extremely exact cutting instruments. Not exclusively is utilizing the waterjet strategy for your steel and aluminum exact, it additionally gives a without burr wrap up. Size 1500mm, 3000mm, 6000mm, 8000mm, 12000mm, etc. 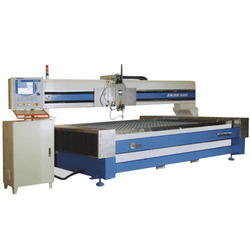 CNC Water Jet Cutting Machine arrives in an assortment of shapes, sizes, and styles, with an assortment of highlights, from an assortment of makers, for an assortment of uses. Their flexibility makes them helpful in overhauling all enterprises. · This technology does not require a lot of heat and so it does not transfer over to the material, which can alter the properties of a material. · It is used for processing of almost all materials to give a precise product. · It is eco-friendly as there is little to no waste of water and does not produce any poisonous gas. · Less material is wasted due to narrow bridges and ribs, which gives precise cutting. · There is no tool manufacturing or storing cost. · It is quick to install and requires less maintenance. · This machine is linked with the CAD/CAM programming system. 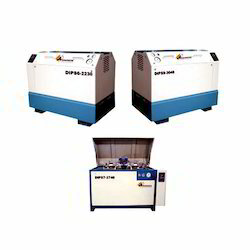 Manufacturer, exporter and supplier of Abrasive Water Jet Cutting Machine. We are the leading manufacturer and supplier of Abrasive Water Jet Cutting Machinemade from high quality material. In the rough water jet, the water stream quickens grating particles which are what dissolve the material being cut. The materials added to influence a grating reaction for incorporate suspended coarseness or different abrasives, for example, garnet and aluminum oxide. In either waterjet, the water or grating blend that leaves the spout is running at more than 900 mph. With that stunning force comesa good exactness. With that sort of energy, you can start to see that it's splendidly legitimate that an Abrasive water jet cutting machine can slice through any semblance of marble, rock, stone, metal, plastic, wood, and stainless steel. Not just that, they can likewise slice through four inches or a greater amount of material when assembled. 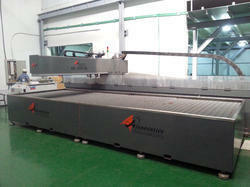 Manufacturer, exporter and supplier of Abrasive CNC Water Jet Cutting Machine. Do you trust water can cut delicate material like cake or a modern material like thick steel pieces? Have you at any point imaged a bone surgery being directed utilizing water as a cutting apparatus? A stream of water, when pressurized up to 50,000 PSI turns into an effective cutting device that can be utilized as a part of a heap of utilizations. 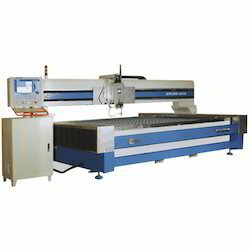 Gantry Type Water jet Cutting Machine can likewise be utilized for puncturing a material or penetrating gaps. Furthermore, the best part is, it is thought to be more productive than other warmth based cutting strategies, for example, lasers and plasma cutting. 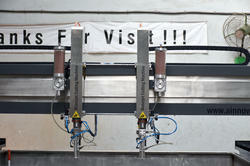 Waterjets dispense with airborne clean particles, smoke, exhaust, and contaminants from cutting materials. The machine is bridge type structure through which we can cut any profile on metal as well as non metal plates. 1) Cold Cutting without thermal influences. 2) Material saving production due to reduced cutting width. 3) Flexible processing of all virtually material with consistent high quality. 4) Tension-free processed parts due to minimal cutting force. 5) Environment friendly & clean production without poisonous gas. 6) Close linking with the CAD/CAM programming system. 7) High productivity through multi head cutting system & multi layer cutting. 8) High-Performance drive system, which permit high-precision production of parts as well as the highest processing speed. We offer our clients comprehensive range of water jet cutting system and UHP pumps that are fabricated in compliance with the industrial standard. Water jet machine uses cold supersonic abrasive erosion that helps to cut any materials such as metals and nonmetals. The highly pressurized water stream is provided that forced through a tiny area which carries abrasive garnet to erode away the material. Moreover, our range is can be selected as per the length width of the material. With Multi Cutting Heads In Waterjet Cutting Machine the cutting efficiency which results in saving of time and thereby increases the production and decrease the production cost. Waterjets are viewed as a green innovation. For one, there is no dangerous waste delivered during the time spent cutting. Besides, since huge bits of reusable piece material can be removed, a waterjet avoids superfluous waste that happens when utilizing conventional cutting techniques. There are considerably more ecological preferences to utilizing a waterjet for cutting your steel or aluminum. 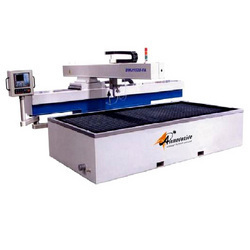 The Multi Cutting Head Water jet Cutting Machine utilizes almost no water. It ends up being around one half to one gallon of water utilized every moment. The sum relies upon the cutting head opening size. Also, the water that is utilized can be reused utilizing a shut circled framework. Free water is frequently sufficiently perfect to channel and discard through depletion. Rough cutting by CNC Water Jet Cutting System or grating planes ended up noticeably normal in the 1980s. Grating planes join water and a coarse substance, similar to garnet, and require three extra segments - a garnet container, metering gadget and blending chamber - to slice through hard materials, similar to copper, metal, aluminum, steel, glass, fired, quartz or stone. Things produced using these materials incorporate riggings and different parts, and also pieces for specialists. A waterjet is a machine shop device used to cut metal parts with a high-weight stream of water. As astonishing as that may sound to the layman - envisioning water slicing through steel - that is exactly what waterjet innovation does, and with exact outcomes. The Waterjet has shown that it can do things that other technologies simply cannot. For cutting whisper thin details in stone, glass and metals. Waterjet has proven itself unique. We are leading manufacturer, supplier of CNC Water jet Cutting System, which are perfect for creating corporate logos in decorative designs on walls or inlaid into floors, countertop parts, faucet and sinkholes as well as a smoother radius off sharp edges of slabs cut with saws. Standard Abrasive Water Jet Cutting Machine is a high-pressure water jet cutting machine used to cut various materials. Now cutting has become even faster, smoother and more precise. Standard abrasive water jet cutting machine is one of the fastest growing machinery in cutting industry because of its advantages. Our expert uses supreme quality copper, mild steel and stainless steel to manufacture abrasive water jet cutting machine. We, the world’s leading manufacturers of standard abrasive waterjet cutting machines able to provide quality products. Our manufactures machines are highly durable because of supreme quality material used to manufacture waterjet machines. Our experts are engaged in offering you supreme quality cutting machines which can make your tasks easier than ever before. Owing to a vast base of experts and resources, we are able to provide best to our customers. 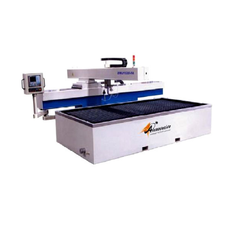 Our Heavy Duty Aluminium Cutting Machines are known for their precision and heavy duty applications. Our machines are well known in the market for their cutting capacity of undergoing heavy duty applications.Our experts manufacture a large variety of cutting machines and supply these to our clients. That is why our range of products is highly in demand especially in engineering industries to do their projects with precision.